Beatrice Akyeampong alongside her daughter, Dr Vanessa Apea. Rising stars innovation award – sponsored by NHS Digital: Ghazala Yasin: cardiology nurse consultant and nurse angiographer, Buckinghamshire Healthcare NHS Trust. Operational service excellence award – sponsored by UNISON: Evelyn Beckley: Patients’ Affairs Officer, South West Yorkshire Partnership NHS Foundation Trust. Clinical excellence award for medics – sponsored by British Medical Association: Dr Sanjeev Nayak: Consultant Interventional Neuro-radiologist, University Hospitals of North Midlands. Clinical excellence award for nursing – sponsored by Royal college of Nursing: Dennis Singson: Community Mental Health Nurse and Nurse Prescriber, Crisis Resolution and Home Treatment (CRHT) Sussex Partnership NHS Foundation Trust. Clinical Excellence Award for allied health professionals –sponsored by Care Quality Commission: Kashmira Sangle: Physiotherapist and Clinical Lead, Berkshire Healthcare NHS Foundation Trust. Top leadership award – sponsored by NHS Leadership Academy: Doreen Black: Matron for Oncology and Haematology, Royal Wolverhampton NHS Trust. Research and policy development award – sponsored by Health Education England: Dr Amos Burke: Associate Director, National Institute for Health Research Cancer Research Network for Children’s Cancer and Leukaemia, Cambridge University Hospitals NHS Foundation Trust. BME inspirational leader award – sponsored by NHS Improvement: Dr Bijay Sinha: Consultant Physician, Barts Health NHS Trust. 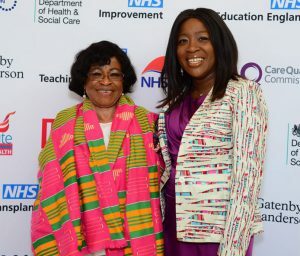 Contributing towards improving health inequalities award – sponsored by Public Health England: Beatrice Akyeampong: Retired Nurse, Barking, Havering and Redbridge University Hospitals NHS Trust and Dr.Vanessa Apea: Sexual Health Consultant, Barts Health NHS Trust. Unsung hero award – sponsored by The Guardian: Judith Fairweather: Mental Health Nurse and Deputy Director of contracting North and East London Commissioning Support Unit. NHS lifetime achievement award – sponsored by NHS England: Comfort Offorjindu: Retired Nurse, Whittington Health NHS Foundation Trust. Dr. Nayak is a Consultant Interventional Neuroradiologist at University Hospitals of North Midlands, who introduced and pioneered Mechanical Thrombectomy for stroke patients in the UK. After obtaining Neuroradiology fellowship from the Neurosciences Centre at Newcastle-Upon-Tyne, he did a post-fellowship training in mechanical thrombectomy in Austria. He brought back the skills he acquired in Europe and helped set up the Mechanical Thrombectomy service in Staffordshire that has become one of the leading centres of excellence for minimally invasive Stroke thrombectomy in the UK.